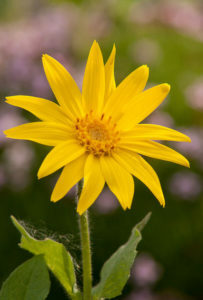 Arnica Benefits: Arnica grows in the mountain woods and pastures of central Europe and Russia, the Pyrenees and in Northern America and Canada. The dried flower heads and rhizome are used herbally and was first used by Swiss mountaineers to help prevent sore and aching limbs. It has seldom been used internally because of its irritant effect on the stomach. It is both a famous herbal and homeopathic remedy for wounds, bruises and other injuries of all kinds. Arnica extract has been reported to increase the resistance of animals to bacterial infection by stimulating the action of white blood cells to clear away harmful bacteria. It has for instance been shown to be effective against salmonella. It has been used extensively for strains and bruises, contusions, and ecchymoses. It exhibits an anti-inflammatory effect and facilitates reabsorption of internal bleeding. In the form of liniments and plasters, arnica has been used in the treatment of lumbago and pack pains. It can be used safely and internally in homeopathic medicine for internal haemorrhages, epilepsy and seasickness. Currently while this herb should not be taken internally because of its potential toxicity, it provides us with one of the best remedies for external local healing and is considered best used for the treatment of sprains and strains. The herb itself used externally will help in the relief of rheumatic pains, the pain and inflammation of phlebitis and similar conditions. It may be used wherever there is pain or inflammation on the skin so long as its not broken. Applied promptly, it helps prevent the formation of bruises by stopping the capillaries from bleeding. It works by stimulating the activity of white blood cells which process congested blood, and by dispersing trapped fluids from joints and muscles and bumped and bruised tissue. It also has anti-inflammatory and anti-bacterial qualities and it is these that help to reduce pain and swelling as well as improving wound healing. Constituents: Essential Oils, sequiterpene lactones, bitter glycosides, alkaloid, polyacetylenes, flavonoids, tannin and cartenoids. Arnica contains the substance: helenalin which is toxic in large amounts. Actions: Anti-inflammatory, anti-ecchymotic, vulnerary, anti-oedematic, stimulant, diuretic. Contraindications: Arnica preparation is not used internally because of its irritant effect on the stomach (except homeopathically). In topical application, caution should be exercised and the medication should be withdrawn at the first sign of dermatitis. Arnica should not be applied to broken skin because of its danger posed by absorption.